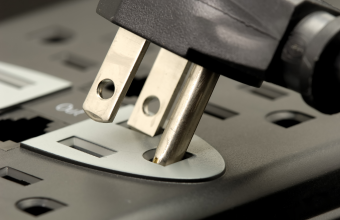 Mick asks: Why do some things have plugs with two prongs and others need three to work? To provide a source of power, electricity must flow in a circuit. (Although, you might be surprised to learn the net velocity of the flow of the electrons is actually quite a bit slower than a turtle.) In a typical American outlet, the circuit is comprised of a right vertical slot connected to the “hot” wire and a larger left vertical slot connected to the “neutral” wire. The plugged in device itself (the load) completes the circuit, with power flowing through it. So what’s the third prong needed for then? This third prong is the ground. Both the neutral and the ground are connected to an earth ground in the main breaker box in your home. The difference between the two is that the neutral completes a circuit with the hot wire and normally carries some amount of current (which is why it’s insulated), while the ground does not normally carry any current whatsoever and is not connected to the circuit at all (unless something has gone wrong). It simply is used to connect the external conductive parts of the device to the earth and, thus, in normal operation is completely unnecessary. This is why you can use a 3-prong to 2-prong plug adapter to bypass having to use the ground line and the device will still work just fine. So why have both a neutral and a ground when they both ultimately just tie to the earth ground bar in the main breaker box? Among a few other benefits, this is primarily so that if something should go awry with the device, like a stray hot or neutral wire coming into contact with the outer conductive parts of the device (for instance, if the insulation wears away or a wire comes loose), you don’t die or get seriously injured if you touch the device and it’s plugged in. You see, absent a separate ground in such a malfunction, once you touched the conductive bits of the device, you may become the path to ground and a surge of electricity would flow through you until ultimately tripping the breaker in your breaker box. With the separate ground, the electricity simply surges through that wire until the breaker is tripped, cutting off power to that line when the surge is detected. This not only helps to ensure you don’t get shocked, but also reduces the chances of a fire starting due to the short via making sure the breaker is tripped immediately after the short happens. So what about the devices that lack this third ground prong? How is this safe? They (usually) have at least two layers of insulation between the conductive components of the device and any part of the device you can touch. To achieve this cheaply, often the outer casing of these devices are made entirely of plastic or some other non-conductive material. Why are Electric Wires Color Coded the Way They Are? There are more than 400 deaths and about ten times that number in injuries each year in the United States due to people accidentally getting electrocuted. The introduction of Ground Fault Circuit Interrupters (GFCIs) into the U.S. has reduced the number of annual household electrocution deaths by 75%. GFCI’s work by “sensing” the difference in the current flowing into the circuit and out, and if it is off by even a small amount (so some of the current is going somewhere it shouldn’t), it cuts off power to the circuit. What is the difference between neutral and ground?? What is the difference between two- and three- pronged plugs? Why do television plugs have only two pins? Just a reminder electrocuted is a portmanteau of electric(ity) + executed. So injuries from electricity by definition are not electrocutions. This is from Bonus fact 1. So what is the proper term for accidently getting killed by electricty? Technically, in 120v circuits the white wire is not a neutral, it’s a common or return. Neutral wires only occur in mutli-phased circuits, the simpilist being a household 230v, where the voltage to either hot conductor and the white wire is half of the total voltage provided, thus making the white grounded wire the zero point of the circuit, or neutral. Ah, Dallas, white IS “neutral” in single OR multiphase circuits. Here’s a quick test: connect a voltmeter to white and to ground. It will read zero volts as there is no potential. Connect a voltmeter to any “hot” lead in a 110-120V circuit, and to white and you’ll get 110-120V (in the US at least). Connect it to red or black, plus white and you get 110-120V either way. Connect it to two hot leads and you’ll get approximately double – 240V. The hot leads have potential, white does not and therefore is neutral. White is not “half” of anything. Red and black are each n=110-120V.